Letter of Recommendation For Further Studies by Employer while doing job with scholarship from the company. I am writing in favor of Mr. M Umer Farooq who is working in my company XYZ in Power Engineering department. He is a talented and devoted employee and intended towards further studies in specialized field of power engineering. I recommend him for further studies in Masters of his desired area in Institute XYZ so that he may enhance his technical and critical skills. 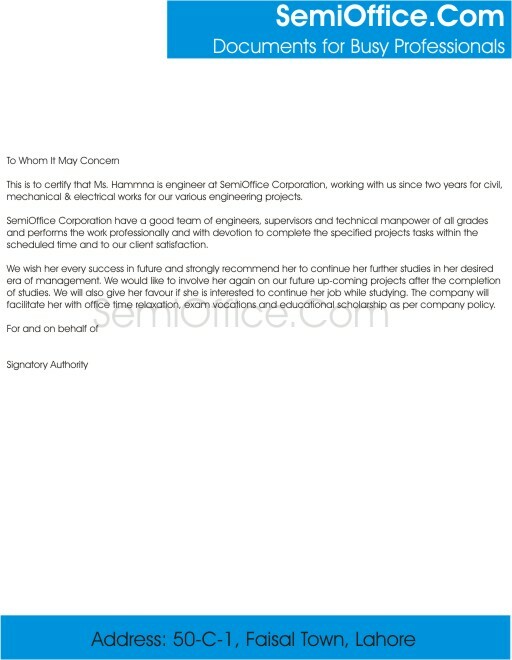 This is to certify that Ms. Hammna is engineer at SemiOffice Corporation, working with us since two years for civil, mechanical & electrical works for our various engineering projects. SemiOffice Corporation have a good team of engineers, supervisors and technical manpower of all grades and performs the work professionally and with devotion to complete the specified projects tasks within the scheduled time and to our client satisfaction. We wish her every success in future and strongly recommend her to continue her further studies in her desired era of management. We would like to involve her again on our future up-coming projects after the completion of studies. We will also give her favour if she is interested to continue her job while studying. The company will facilitate her with office time relaxation, exam vocations and educational scholarship as per company policy. It brings me great pleasure to recommend Mr. Goldstein for further studies. He has been working at our company as Marketing Executive for two years. Given his experience and skills, he can improve himself by adding a master’s degree to his qualification. He is a graduate and has extensive experience in the field. He is currently working part time at our company and wishes to continue his studies in the morning. He is therefore commended to any institution he may apply. I am willing to provide any further information related to this matter.